Srinagar, March 08– Chief Minister Mr. Omar Abdullah this morning paid obeisance at Aasar-e-Sharief, Hazratbal and took stock of the arrangements made for Eid-e-Milad-un-Nabi (SAW). The Chief Minister was accompanied by his Political Advisor, Mr. Devender Singh Rana and MLA Amirakadal, Mr. Nasir Aslam Wani and Principal Secretary to the Chief Minister, Mr. Khurshid Ahmad Ganai. On this occasion, dastarbandi of the Chief Minister was also performed in the Shrine, where he also prayed for peace, welfare and development of the people of Jammu and Kashmir State. Later, the Chief Minister took stock of the arrangements made by various departments for the devotees in connection with the Urs. The Chief Minister had yesterday taken a high-level meeting of divisional officers here to review measures for facilitating devotees who throng the shrine from all corners of the Valley on Eid-e-Milad-un-Nabi (SAW). The Chief Minister went around the holy shrine and issued orders for sprucing up the premises by properly illuminating it so that the great marble structure stands out in full glory. He instructed the Wakf Board to change the furnishing of the main shrine and construct a sarai for the pilgrims. 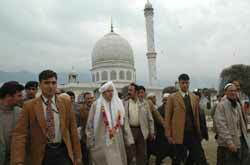 Mr. Abdullah also checked one-by-one the arrangements made by various departments in facilitating the devotees. He visited the camp put up by the Health Department and instructed the doctors to keep all medicines and first-aid kits handy in case of emergency. He also went to the Fire and Emergency Services yard set up within the premises of the Shrine. While inspecting some of the water points installed by the PHE department, the Chief Minister gave orders for installation of additional points in anticipation of the heavy rush of devotees to Aasar-e-Sharief. The Chief Minister laid stress on making proper arrangements for smooth and hassle-free movement of vehicles to Aasar-e-Sharief so that devotees who come from all parts of the State are not caught in traffic jams. He issued instructions to Traffic Police for strictly adhering to one-way traffic rule during the Urs days to the shrine and keeping adequate number of buses available to take people to Hazratbal. About 1,000 buses have been pressed into service for carrying the devotees from within the city while another fleet of buses will bring in followers from other districts of the Valley. The Chief Minister expressed satisfaction over the arrangements made by the divisional administration. He called upon all the heads of the departments to ensure that the devotees don’t face any problems during the Urs days. On reaching Hazratbal, Mr. Abdullah was received by Vice Chairman of Wakf Board, Prof. M. Y. Qadri, Divisional Commissioner, Kashmir, Mr. Masaud Samoon, Deputy Commissioner, Srinagar, Mr. Mehraj Ahmad Kakroo, Members of the Wakf Board, besides a large number of people present on the occasion.